Avengers Tower. The SHIELD Hellicarrier arrives. Our Maria Hill is talking to Ultimate Nick Fury, they are not finding either Iron Man. 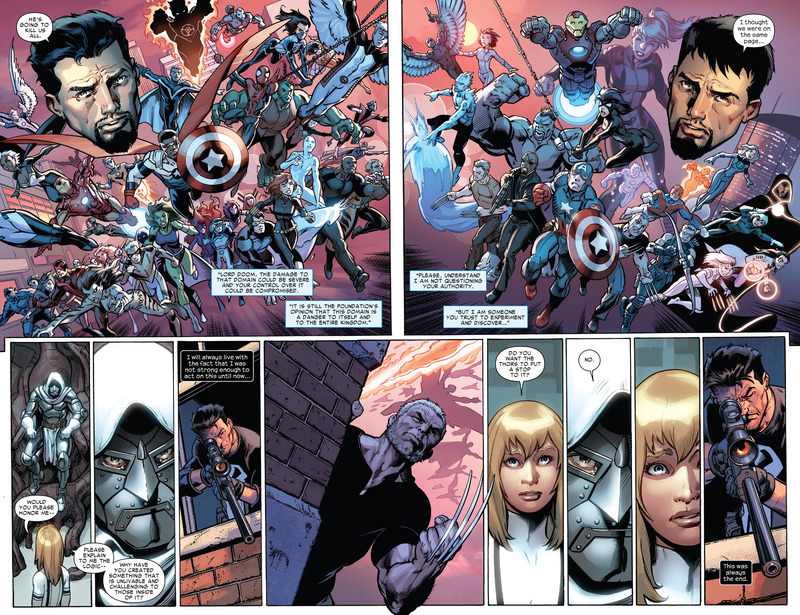 Out from the Hellicarrier comes – Ultimate Thing, Ultimate Hawkeye, Spider-Man, Ultimate Cap (who they still not explaining how he is no longer dead), FalCap, Ultimate Human Torch, Ultimate Invisible Woman and Black Widow. 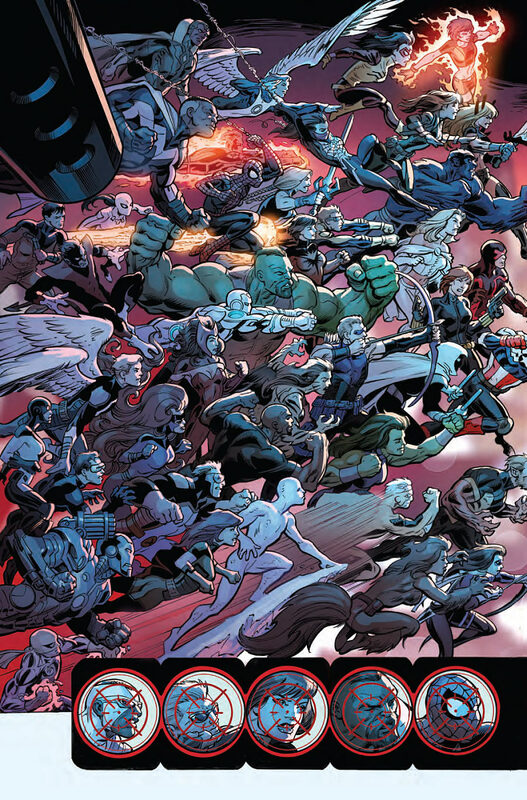 The gathered heroes are not looking forward to fighting two Iron Men and a Hulk. They are not sure how to proceed, as they are in front of the door. Do they knock, or do they knock the door down. Just then, every Iron Man armor greets them. Without a minute passing, Ultimate Cap figures out what is happening. Cap notices that the Iron Man armor was holding back. This was all a distracting ploy. Our Tony wants to protect his friend, Banner, and he really didn’t want to fight his friends. He’s okay with annoying Ultimate Fury. Ultimate Stark wants Tony to break the communication signal. Brooklyn. Bombshell is telling civilians to run, as the Punisher is trying to kill her, with a sniper rifle. I didn’t know she could use her blasting powers to fly (or jump high). She finally gets to where he use to be, but only sees the rifle. Punisher was behind a wall and shoots Bombshell. Just then, Ultimate Cloak and Dagger (to bad that we won’t see the two Cloak and Daggers meet!) arrive on teh scene and take out Punisher. Bombshell is bleeding but only from her ear. Punisher is constantly ranting about how it is all of their faults. Cloak absorbs the Punisher, into his . . . cloak. Cloak gets a belly ache and Punisher comes out, firing. Punisher throws some grenades and leaves. I do believe this is Ultimate Punisher, who is crazier than regular Punisher. I like how Bombshell says “swear word” instead of actually swearing, when Ultimate Iron Man arrives. He needs the young heroes help. He has called the FBI and the police, to deal with the Punisher. As that has always worked in the pass. Doomstadt. The High Court of Doom. Doom. Valeria is talking to Doom, informing him of the Manhattan domain. We get a hint that there are dimensional anomalies, that has resulted in doppelganger chaos. So that might explain why nothing there makes sense. Doom has a special interest in this region. She tells him that there is a fraction that is going against his will. Ultimate Tony wants to tell Doom’s Science team of their findings. Proper Stark wants to keep it a secret, until they know something for sure. Proper Banner really suspects that they should have worked this out before hand. I’m not really sure what this page is for, besides to give Bagley a chance to draw all of these characters. 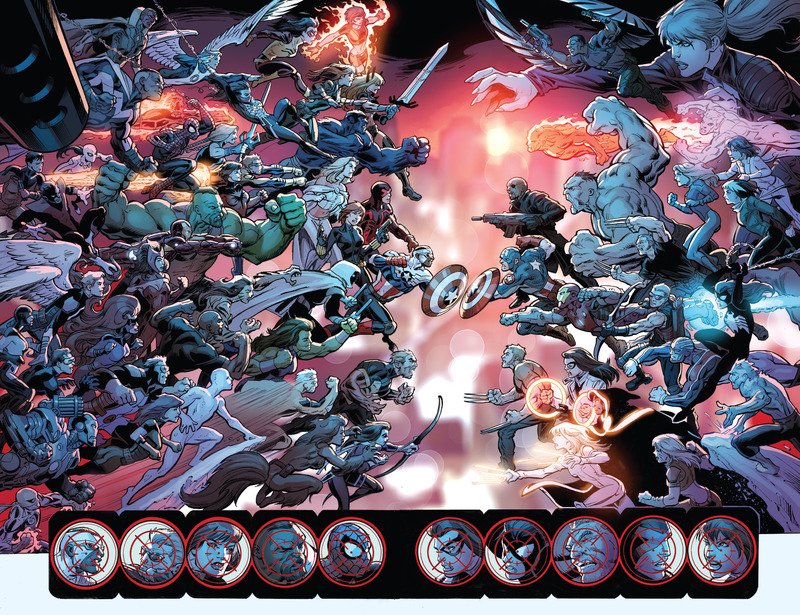 Which is pretty great but it goes to show, that this isn’t quite the last hurrah of the Ultimate Universe, like how it was billed. 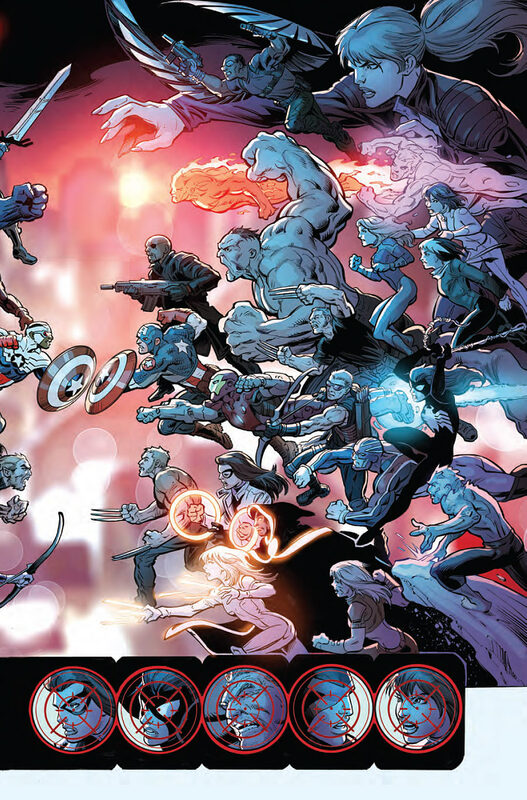 It does have Old Man Logan in it, as he has escaped his region and is now touring Battleworld. Which is tight continuity, but it helps that Bendis is writing both of these titles. Doom wants to see how this all plays out. No, it is exactly the same page. Still pretty great, but I’m glad the previous page was included. 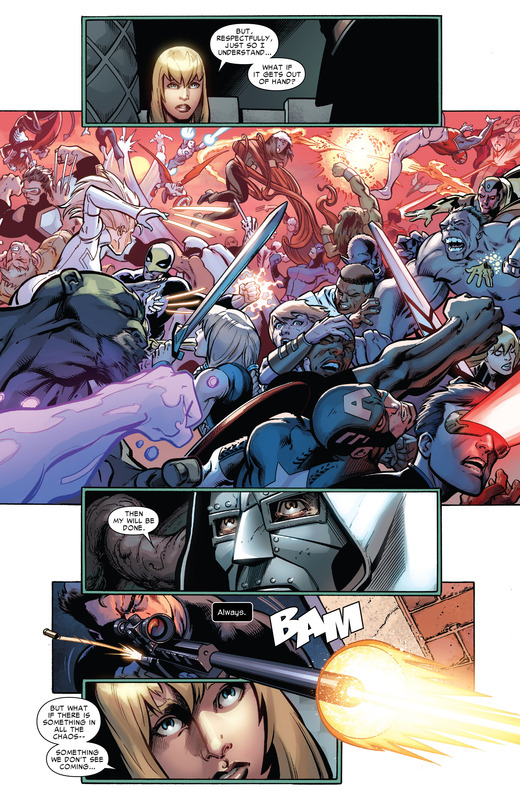 I’m not really sure what makes the two universe’s heroes start fighting each other, the next issue is the last – so we have to get to this moment eventually. Doom isn’t concern, as he can just undo and restart this region – like how he has, in the past. 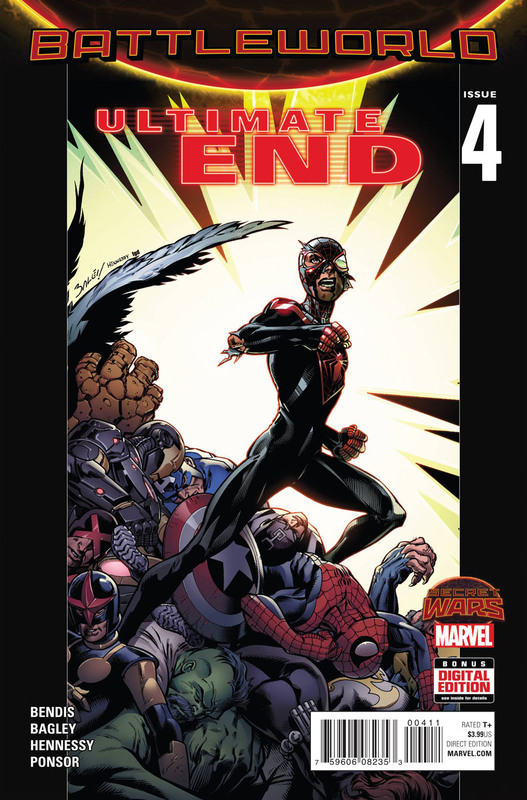 Issue ends Valeria wondering what would happen if something unexpected happens – which we see Miles Morales webslinging, so I guess he’s the last hope. It would make sense, as he has to jump over to the Proper New Marvel Universe. Hopefully we get answers in the next and final issue.